Plans for New 51 million dollar Sheriff’s Station Gets Green Light from The City of Santa Clarita and Los Angeles County. 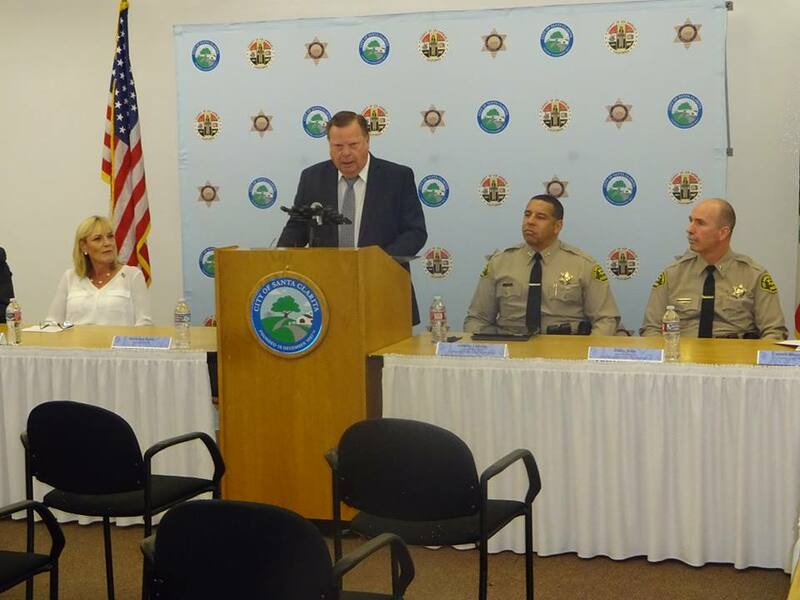 Santa Clarita Mayor Bob Kellar officially announces the agreement between the City of Santa Clarita, the County of Los Angeles and the Los Angeles County Sheriff’s Department, taking the first steps toward building Santa Clarita Valley’s first new Sheriff’s Station since the 1970’s. Groundbreaking on the three year building project is expected to break ground in about a year. Photo by Margie Anne Clark. Santa Clarita, Calif. – The City of Santa Clarita announced that the City of Santa Clarita, the County of Los Angeles and the Los Angeles County Sheriff’s Department have taken the first steps toward building Santa Clarita Valley’s first new Sheriff’s Station since the 1970’s. “Ground breaking for the new Sheriff’s Station will be in about a year,” said City of Santa Clarita Mayor Bob Kellar at a press conference on Monday announcing the new station. “It’s because of partnerships like, that this city has been able to become such a great city,” Kellar noted. Kellar thanked and acknowledged county and city officials for their role in helping to maintain and enhance the quality of of life for residents of the Santa Clarita Valley. The state of the art 51 million dollar facility will be located on City-owned property on Golden Valley Road between Centre Pointe Parkway and Robert C. Lee Parkway, where the temporary Los Angeles County Fire Station 104 is currently located. The new two-story, 44,339 square-foot Santa Clarita Sheriff’s Station will include a 4,000 square-foot service garage and helipad. The current Santa Clarita Sheriff’s Station, located at 23740 Magic Mountain Parkway, was completed in 1972 and is 25,100 square-feet in size. Since the time the station was built, the population of the Santa Clarita Valley has increased from approximately 50,000 to 299,000. The new station will allow deputies to effectively serve the entire valley. “I thank everybody for helping us to getting to this point,” said Chief Jacques “Anthony” LaBerge of the Los Angeles County Sheriff’s Department. LaBerge noted that he envisioned the idea of a new Sheriff’s station in the SCV more than 10 years ago when he served as the Captain of the SCV division. On May 24, 2016, a Memorandum of Understanding (MOU) was approved by the Santa Clarita City Council that provides joint funding by the County of Los Angeles and the City of Santa Clarita for the construction of a new, centrally-located station. On May 31, 2016, the Los Angeles County Board of Supervisors approved the MOU. The new station will be located on City-owned property on Golden Valley Road between Centre Pointe Parkway and Robert C. Lee Parkway, where the temporary Los Angeles County Fire Station 104 is currently located. The new two-story, 44,339 square-foot Santa Clarita Sheriff’s Station will include a 4,000 square-foot service garage and helipad. The estimated cost for construction of the new station is $51 million, as follows: $38.5 million for construction, $11.5 million for design and project management, and $1 million for furniture and lockers. The County of Los Angeles will contribute $15 million to the project, and the remaining $36 million will be funded by the City of Santa Clarita. The new Sheriff’s Station will be constructed under the management of and owned by the City of Santa Clarita. A new and larger Santa Clarita Valley Sheriff’s Station is part of the City’s Santa Clarita 2020 Community Strategic Plan. Information regarding the SantaClarita2020.com gives a complete list of projects, programs and services the City is working toward. Santa Clarita Mayor Bob Kellar officially announces that the City of Santa Claritathe County of Los Angeles and the Los Angeles County Sheriff’s Department have taken the first steps toward building Santa Clarita Valley’s first new Sheriff’s Station since the 1970’s.